To celebrate Jane's and my birthdays, we had a great lunch at Robin's Teppan of Grand Formosa Regent Taipei. 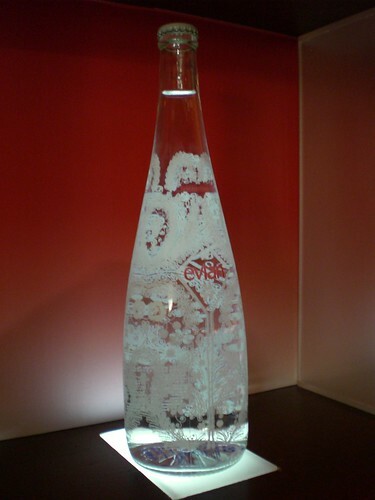 After having the luxurious teppanyaki, we enjoyed coffee and dessert at Robin's Lounge and found this interesting display; the evian 2008 limited edition bottle designed by a famous French fashion designer - Christian Lacroix. Though a wall full of designed Evian bottles looks stylish, the big sign of evian makes it very commercial indeed. DO YOU LIKE TO HAVE A GOLD BRICK?